Midland RV Sales, Inc. proudly services folding trailers, truck campers, travel trailers, 5th wheels and motorhomes. Let us use our experience and knowledge servicing recreation vehicles to keep you camping. ​The degree of treatment needed will vary based on membrane cleanliness, UV exposure and duration between treatments. ​Inspection of all seams on side walls and openings where components are installed to detect dried caulk, sealants and seals as well as identify cracks, separation of caulk, missing screw cover and torn seals. ​Inspect, clean and lubricate tracks and seals to prevent damage caused from blockage of tracks, dried or torn seals, and worn gears. Recommended when taking a trailer out of storage or every spring if using your trailer yearly. Helps prevent blowouts and brake malfunction. Wash and wax of trailer exterior to clean and protect against oxidation and fading. ​Drain fresh water tanks, drain and bypass water heater, and fill lines with antifreeze. Complimentary roof inspection is provided. ​*Customer is responsible for having dumped waste tanks. ​Draining of antifreeze from lines, turn bypass on water heater, check water system for leaks. Complimentary roof inspection is provided. ​A detailed inspection of the RV interior and exterior to identify upcoming repairs and maintenance needed. This is an excellent service to help budget for repairs or assist the DIY handyman to identify the proper products needed for maintenance at home. ​A personalized instructional walk-through of your RV that will teach how to use and maintain your coach as well as identify future service needs. ​A complete check recommended annually of all electrical connections, grounds and fuses to protect against appliance damage. Includes converter/inverter inspection. Inspection and tightening of all fittings, drains, water related tanks and appliances. Excellent for preventing/detecting leaks. ​A complete inspection and cleaning of electrical and LP connections as well as orifices. ​An inspection of 110 volt/12 volt /LP connections as well as burner heads on stove top and oven. ​Includes a voltage check, seal tightening, condensation drain tube inspection, cleaning of coils, air duct openings, and air filters. Thermostat inspection for non-central ducted units. Includes roofs, sidewalls, floors, and slide-outs for folding trailers, travel trailers, 5th wheels and motorhomes. Replacement of rubber and aluminum roofs. Rebuilding of roof and roof sidewalls for folding trailers. Includes cleaning, re-coating and caulking of seems of roof. Re-Sealing of trailer includes removing of corner molding and trim along roof and sidewalls as well as windows and other openings to replace the butyl tape sealant that can get dry and brittle over time. After reinstalled all trim and openings are re-caulked. Replacement of broken or missing windows. Replacement or rebuild of doors with water damage or exterior damage. Repair of appliances that may have a damaged component - such as a circuit board, igniter, switch, compressor etc. We do stock a variety of parts for older models. Replacement appliances are also available. Customers are always consulted prior to a replacement ​and are assisted in helping to select a new appliance that best fits their coach. Canvas and hardware replacement are available for most makes and models of awnings. Complete awning replacement when needed. Replacement of slide-out seals and motors. Cleaning and adjustment of tracks are available as well and replacement when needed. Repair and replacement for pop-up lift system cables, lift arms, gears and winches. We service all makes and models and specialize in Coleman/Fleetwood. Canvas replacement and patch kits for folding trailers. This process may take up to 10 weeks. RV "Warranty" is any repair that is required due to a manufacturer or installed component defect/failure covered by the manufacturer. Items that are considered "warranty" will vary from manufacturer to manufacturer. ​Midland RV is happy to warranty all makes and models of campers as permitted by the manufacturer. Please understand that individuals who purchased from our facility will be given first precedence for appointment openings during peak season. ​At Midland RV we not only work on campers, but we are campers! We understand the importance of having your camper during the warmer months to go out and explore the great outdoors. Our goal is to provide quality service in a timely manner and get your trailer repaired as soon as possible - not to mention our parking is snug. The majority of manufacturer claims are held up by waiting for parts or manufacturer approval. To get the system started we ask that you complete the form below. You will receive a confirmation e-mail if it was received. A store representative will then contact you within 48 business hours for further information and to advise on the next steps. Please provide an itemized list of concerns and a brief description. I.E. Lights do not work. There was a flash and beep and the lights went out. Please provide a picture for each item of concern. An extended service contract provides additional coverage to care for your RV so you can worry about packing for your next trip and not the cost of an unexpected repair. We offer a variety of packages an services through our extended service contracts and can help to find the best package to meet your RV needs. Our packages cover new trailers as well as pre-owned units. Even if your unit was not purchased at Midland RV Sales, we are still able to offer an extended warranty service. If you are seeking coverage, please contact our store for more information (989) 631-1231. In addition to offering extended service contracts, we are also happy to work with extended service companies. If you are traveling through state or looking for timely service, please call Midland RV Sales and schedule an appointment. For best service, please have your extended service contract available for reference. Midland RV Sales is happy to help with your insurance needs for all years, makes and models. 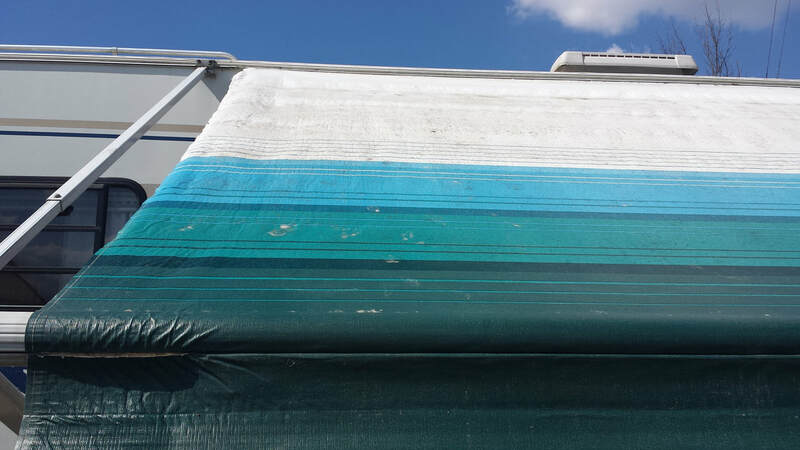 If you are experiencing problems with your trailer -rather an awning ripped off, a roof leak, water damage, damage from a blown out tire or more - we are here to help. Beginning an insurance claim begins with calling to schedule an appointment for an estimate. The estimate fee is $45.00. Most estimates can be done with a drive through appointment and faxing in information to your insurance company. After contacting the insurance company and receiving an approval, a service appointment will be scheduled. Midland RV Sales offers a variety of maintenance and services. Above are the most common routine maintenance and services requested and recommended. If you have questions regarding repairs and services not listed above or would like additional information, please contact our store and speak with an employee or send an e-mail.